On the back of this card was written very lightly in pencil “Fire. ca. 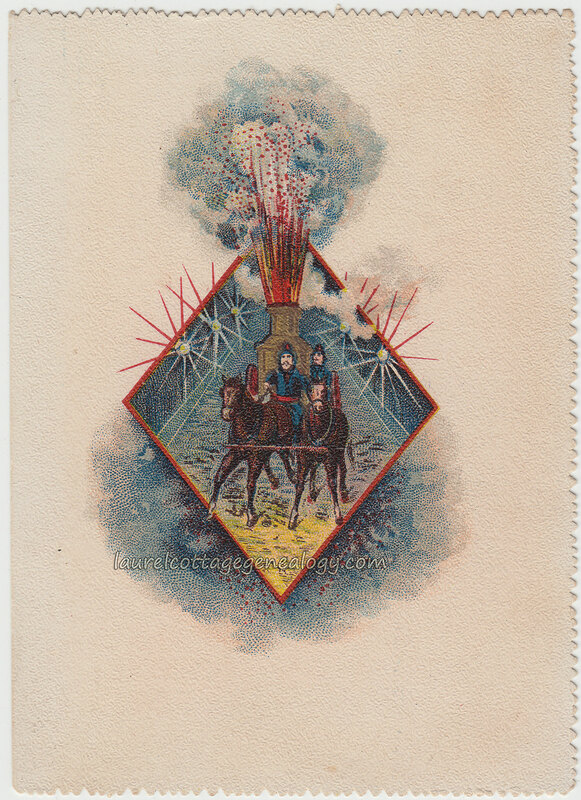 1880” but this was likely done by a prior seller, rather than the original owner of the card. This would be some type of print, a lithograph one assumes, of some beautiful artwork showing a two-horse fire truck, a couple of mustachioed firemen in blue uniforms, pulling a spouting engine. The horses gallop down the road, carrying the men and fire-fighting apparatus right at the viewer. 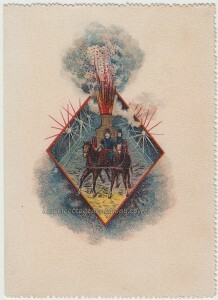 The predominant color on the card is blue-gray, but the representation comes to us as highlighted inside a red diamond shape, with the engine’s burning flames and billowing smoke overflowing outside the diamond. One of the horse’s hooves just barely appears outside the red line: something that would always be deliberately done to help get that flow-y effect. And shooting outside the diamond tableau are some star-like designs on each side of the road (streetlights?) The cloudy-looking colors around the bottom, to me give the effect of horses kicking up dust. All in all a great action scene. Plus notice how the bright yellow at the horses’ feet balances out the other bits of yellow on the card (or vice versa)…..It really seems like the more you look at this one, the more you see. From the public domain, here’s a great video clip of one example of the real thing; taken in 1896.